I relish opportunities to teach classes that don’t completely focus on the mechanics of finding stuff. Yes, it’s important that students understand the ins and outs of different search tools so that they can use them to their full advantage, but I’ve found that most students stumble in their research well before they even turn on their computer. The kind of mental preparation that’s required to approach a research assignment is not always intuitive. It may, in fact, be completely overwhelming for the average undergraduate student. As librarians and scholars I think we have a natural tendency towards inquiry. We tend to think in terms of connections: how ideas compliment or contradict one another, how theories can be applied to practical situations, how concepts in one discipline might spark discovery in a completely different field of study. Whether we realize it or not, we’re quite skilled at coming up with interesting research questions. Yet this skill is one we’ve likely acquired over years of education and professional practice. Our students don’t always possess this skill and have to work a lot harder to set up their research. They need help identifying creative opportunities for research and ways to approach it, lest they fall into the same dull trap of controversial issue papers (you know, the ones about abortion and gun control). In 2010 I read an article in portal: Libraries and the Academy by Jennifer Nutefall and Phyllis Ryder that looked at how librarians “timed” the research question for students. They found that the librarians in their study wanted students to focus their research topics very early on in the research process so that they could more easily zero-in on narrow, relevant research. Conversely, writing instructors encouraged students to delay committing to a research question until they were able to learn more about their topic through more general searching. It made me think that librarians (myself included) were doing it wrong. I completely understand the urge to encourage students to narrow a topic. It makes research easier when you can zero in a particular subject database and search terms. The problem is that students are often completely unprepared to do this because they have very little knowledge on the topic they want to investigate. Encouraging them to do “background research” on their own is almost a guarantee that it won’t happen, and instructors end up grading dozens of papers on whatever topic students were able to cobble together based on sources from the search that gave them the most results. So how do we help students who likely don’t have vast content knowledge develop better research questions in that subject area? April Aultman Becker and I led a roundtable discussion on this topic at the 2011 ACRL conference, and at the 2015 ACRL conference in fabulous Portland we’ll continue to talk about this topic with our friend, Abe Korah, during a panel session. But enough of this shameless plug, onto the ideas! Ultimately, this turned out to be a concept-mapping exercise with an eye towards taking stock of knowledge and establishing connections between ideas. The instructor had asked her students to read a chapter on media violence research that gave them exactly the kind of background knowledge that so many students lack when trying to decide on a research topic. Using information from that chapter, along with a guided learning exercise where they explored Wikipedia and other sources of media-related research, I then led introduced concept-mapping to students as a way of making sense of all the information swimming around in the brain and potentially leading them to a new research question. 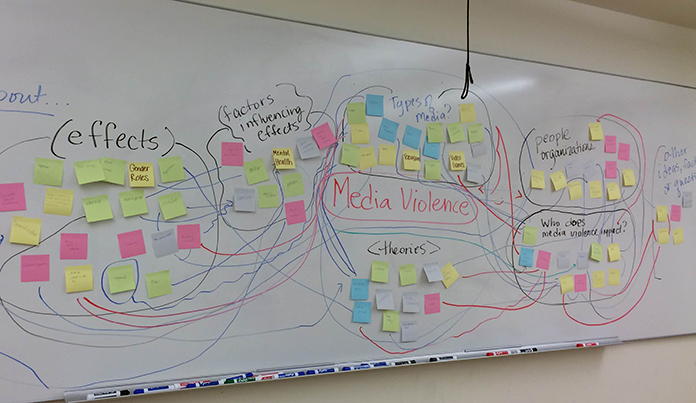 I created the shell of the map on a white board with the main topic (MEDIA VIOLENCE) in the center and different nodes across the board. The nodes included starters like: effects, populations impacted, related theories, researchers & organizations, types of media, other questions, etc. I then gave all 15 students post-it pads and asked them to use each post-it note to write down an idea, concept, theory, person, organization, fact or question and place those notes on the appropriate spots on the board. After doing so, the students took dry erase markers and drew connections between the different ideas and facts on the board. It was messy and fun, highlighting just how interrelated our ideas were. We then discussed these connections and how they are good potential directions for them to pursue their research. 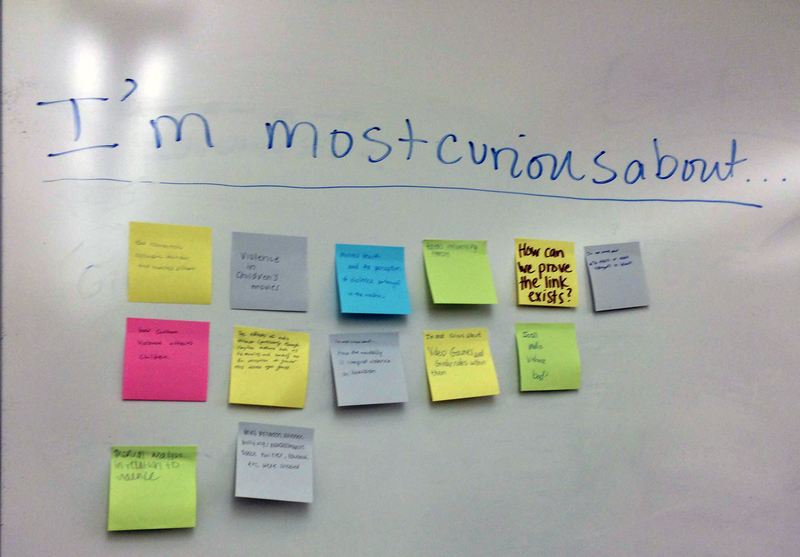 After completing our concept-map, I asked students to respond to the following question while thinking about some of the connections we made: “I am most curious about…” We then talked about these statements as potential research topics or questions. Some topics were quite focused, but others remained stubbornly vague. I’m not going to lie: The activity was ok, but not fantastic. I think I should have done a better job emphasizing that the connections and contradictions in our concept-map are where the really interesting ideas for research happen. When I try this activity in the future (and I will be doing it again), I’m going to have students come up with a research question before we do the concept-mapping exercise and then do it again afterward, to compare any progress they may have made. I’m also going to change the final prompt to “I am most curious about the connections between _________ and _________” or “I am interested in the effect that __________ might have on ___________ .” Again, I think this really stresses the mental work that goes into connecting ideas and how that can lead to more fruitful research pursuits. I think this activity worked because students had the requisite background knowledge to give them a starting point for their brainstorming. Without it, I think I would have seen a lot of blank post-it notes. What are your favorite activities for helping students develop better research questions? I love what you did here, combining concept mapping and the affinity exercise. What a great idea for a class working with the same big ideas! I have also been trying to chip away at the thinking problem. Students want to type a broad idea into Google, use the first three things that fall out, and mash them into a paper. Professors say, “You need to do a better job finding sources.” The real problem isn’t that they don’t know how to find stuff but that they aren’t thinking before acting. They aren’t asking what they know, what they need to know, and making a plan to find out. I piloted a class this week that addresses this question and it included a concept map exercise. Like you, I found my efforts to be moderately successful but no fireworks. I may adapt your exercise next week for an entirely different class working on the US embargo of Cuba….